One of Scotland’s largest private construction firms has taken on an extra 40 staff to meet soaring demand for off-site manufacture of housing. The new recruits, who join construction group CCG’s 600-strong workforce, will support the creation of a second shift working through the night at the firm’s Glasgow OSM facility. CCG’s £10m OSM facility can produce over 3,000 units per annum from its 130,000 sq ft site in Glasgow. 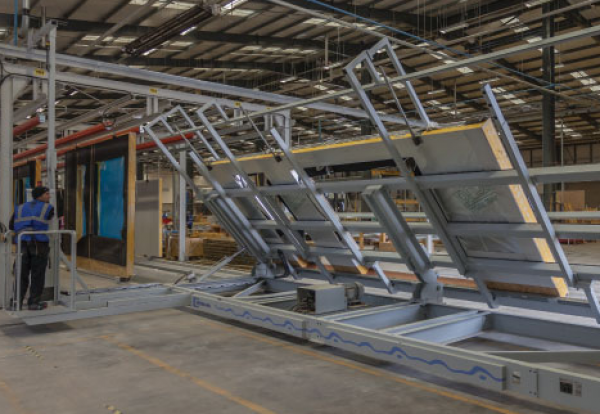 The production hub offers the sector complete flexibility in the delivery of timber systems, from a structural kit to closed panel solutions inclusive of insulation, internal wall linings, windows, doors and external claddings. The facility was recently utilised by CCG to construct 237 sustainable homes at the Commonwealth Games Athletes Villages, with a typical terrace of 8 environmentally efficient townhouses being constructed in just 10 days. CCG Chairman Alastair Wylie said: “This investment and the recruitment of 40 new staff will enable us to operate a second shift and ramp up our production as the sector strengthens. “This on-going recruitment drive demonstrates a strong working partnership with Glasgow City Council through Jobs & Business Glasgow and Clyde Gateway to create employment opportunities in the area.